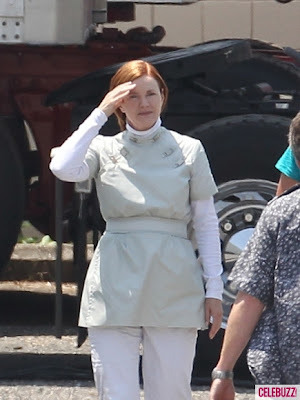 Some images have emerged from the sets of Lionsgate's adaption of Suzanne Collin's novel The Hunger Games. The movie is currently filming in North Carolina and the photos [via Celebuzz] reveal Jennifer Lawrence, Liam Hemsworth, Willow Shields and even author Suzanne Collins in costume as residents of District 12. Josh Hutcherson, Woody Harrelson, Elisabeth Banks, Stanley Tucci, Lenny Kravitz & Wes Bentley also star in the movie which is directed by Gary Ross. The Hunger Games will hit theaters March 23rd 2012. Hit the jump to check out the photos. 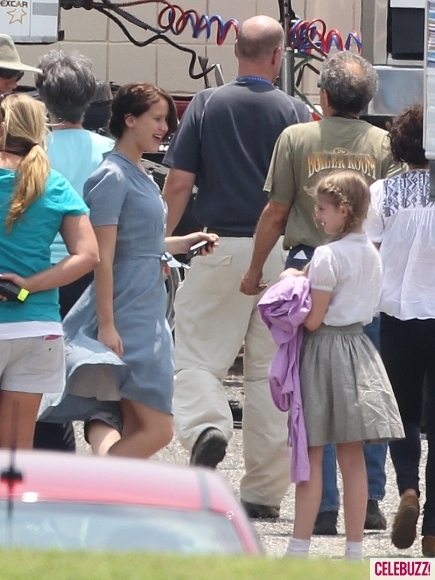 I'm reading: "THE HUNGER GAMES" Set Images Reveal JENNIFER LAWRENCE, WILLOW SHIELDS & LIAM HEMSWORTHTweet this!